The Anglophone East School District says Sackville’s Salem Elementary will be closed Monday for repairs, but is expected to re-open on Tuesday. 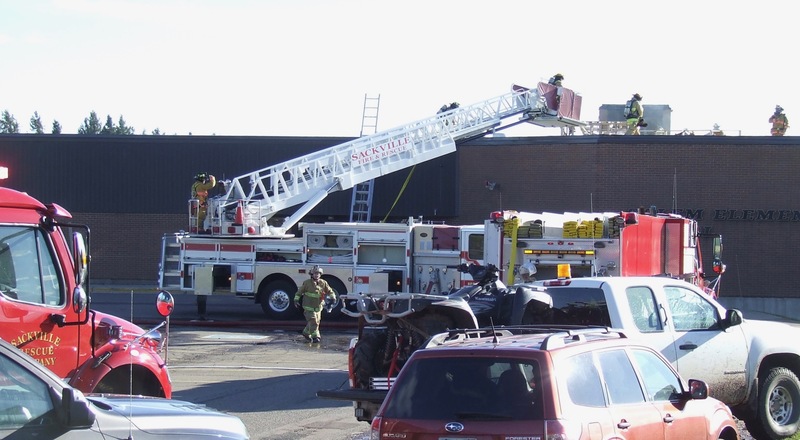 The school closure became necessary after a fire today on the gymnasium roof. Twenty-eight Sackville fire fighters were dispatched to Salem Elementary shortly before 2 p.m. after reports of flames and smoke. Two Sackville pumpers along with an aerial ladder truck were on the scene before more personnel arrived from Point de Bute to assist with fire suppression. Firefighters used a saw to get at the fire so they could put it out with water from a fire hose. Aside from firefighters from Point de Bute, the Chief summoned help from Dorchester to cover other possible fire calls in the area. He says the cause of the fire has not been determined and the Fire Marshall’s office will investigate. Chief Bowser says the last 24-hours have been busy with high winds, downed power lines and at least one transport truck toppled by high winds on the TransCanada. The highway was closed to high-sided vehicles for several hours last night. This entry was posted in Town of Sackville and tagged Fire Chief Craig Bowser, Sackville Fire Department, Salem Elementary School. Bookmark the permalink. Thanks to all the firefighters from our town and beyond. How ironic as we just came back to Sackville (from another town) where we celebrated an adorable kid’s birthday at a fire station. Our fire fighters are our heros. Thank you/Merci to all!